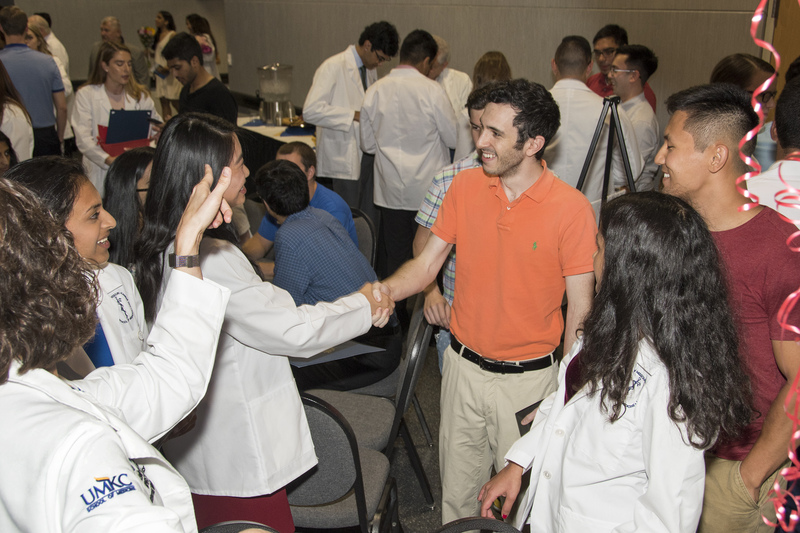 Third-year medical students at the UMKC School of Medicine entering the more intensive clinical phase of their medical school training marked that passage Aug. 5th with their White Coat Ceremony. The ceremony united 110 students who spent the majority of their first two years studying on the Volker Campus with their new docent units at Hospital Hill and Saint Luke’s Hospital. The 2018 White Coat Ceremony was held at White Recital Hall with Jill Moormeier, M.D., chair of internal medicine at Truman Medical Center Hospital Hill, presiding. The third-year students also heard from Mary Anne Jackson, M.D. ’78, the school’s interim dean. And they saw Jared Keeler, M.D. ’94, win this year’s award for the outstanding year 1 and 2 docent. Sponsored by the Arnold P. Gold Foundation, the White Coat Ceremony emphasizes the importance of compassionate care for patients and proficiency in both the art and the science of medicine. It has been a tradition at the UMKC School of Medicine since 2003. Then came the highlight of the event: students learning new docent team assignments and being cloaked in their new white coats. Raymond Cattaneo, M.D. ’03, assistant dean for years 1 and 2, presented the white coats.